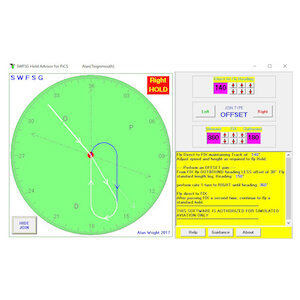 We proudly present to you from Alan Wright (Teignmouth) his “hold advisor” ….. a quick and easy means of obtaining the correct join path to fly to enter a hold. You always wanted to fly the perfect holding? From now on this is possible with the “Holding Pattern Calculator for Virtual Pilots, courtesy of SWFSG (South West Flight Simulation)”. Reset Window Positions – ensures all 3 windows used are all on the main display; only useful if you change your display layout. Float Guidance. if unticked, guidance is shown in the main window, clicking this menu item will hide the main form and show the guidance in a smaller, moveable & sizeable window. NB the pop-up menu is also available from here – right click on the text. Close HoldAdvisor – closes the program! This program uses a file: “C:\HoldAdvisor.ini” to store data in – window data and colours. One will be created, using default data, if it cannot be found so deleting or renaming this file will also revert all reference data to defaults.